In spring in Wisconsin, it inevitably always snows one last time after you think spring has arrived. The grass is green, the robins are finding worms in the grass, then the little flakes begin to fly. The "robin snow" creates a beautiful natural color palette. The bright white flakes contrast the fresh young green grass in a crisp scene. The painting is on 11"x14" prestretched canvas, ready to hang. Colors can be slightly different than on the screen. 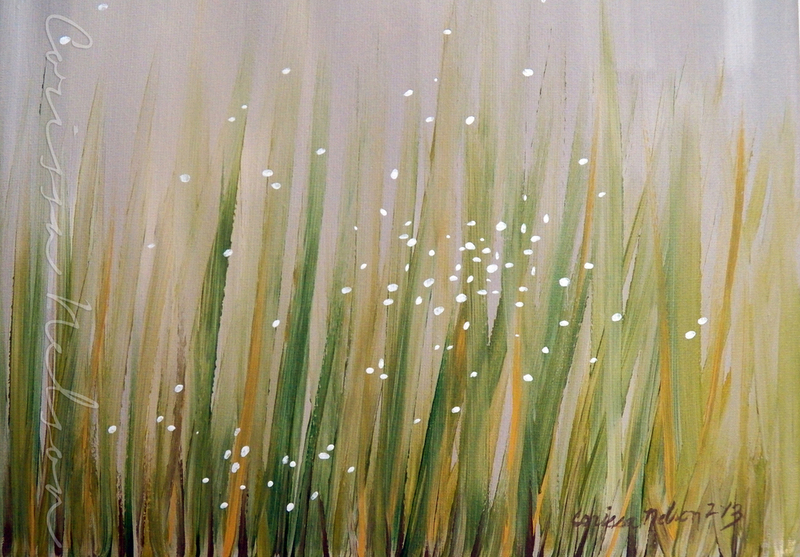 The grey background on this painting is a warm, creamy grey, the greens are also warm grassy green tones. It is for sale here. I'm fending off cabin fever with spring paintings.